Explore the Kokoda trail and experience a trek steeped in the history of WWII where you will learn about the history, culture, and people while surrounded by the lush scenery of Papua New Guinea. Kokoda is an emotional roller coaster. There are many moments of sadness hearing the stories of the young diggers back in 1942. Visit Bomana War Cemetery. This is when the stories we have been telling become a reality. Discover a trek that winds through historic WWII sites and local villages for an adventure that combines history, nature, and local culture. Trek to the summit of the highest mountain in Papua New Guinea and Oceania and enjoy the diverse and beautiful terrain in one of the country's most scenically spectacular areas. If you want to truly experience the highlands of Papua New Guinea this is a must do trek. Planes, boats, trekking and paddling - if adventure and a real Papua New Guinea experience is what you are looking for then look no further - this trip has it all! This expedition is off the beaten track and traverses a corridor that very few visitors walk or paddle. We invite you to come and visit and share with us this most beautiful area of Papua New Guinea. Visit Samaria and Kwato Islands. Spend a half or full day exploring the sights around Port Moresby, from historical sights and landmarks to local parks highlighting the flora and fauna of Papua New Guinea. Single or group bookings available daily. Papua New Guinea is one of the most diverse countries in the world. There are still many unexplored areas and is truly a land of amazing cultures. PNG has over 800 languages and is often described as the "Land of the Unexpected". Why are we still so untouched? If you have to trek anywhere in the country you immediately understand why, it is rugged beyond belief. If people have done Kokoda treks and thought that was difficult it is a walk in the park compared to the rest of the country. There are only 3 ways to travel in PNG, by air, by boat or walk. All roads go no where. It is expensive to travel domestically in PNG, but in its defense if people want to see the true depth of the culture that this land has to offer and be one of very few to experience it, if it was easy to get to everyone would be doing it. We have currently 4 Cultural Tours on the itinerary. These are set dates and the tour program is set around the 4 major cultural shows in PNG. They are the Mount Hagen Cultural Show, the Rabaul Mask Festival, the Kundu Canoe Festival in Alotau and the Tufi Cultural Show. If you have been everywhere and want to see something totally unique then one of the above shows should be considered. They are spine tingling affairs and an experience of a life time. The Kokoda Trail is our most famous trek here in Papua New Guinea. It is steeped in WW11 history and is an emotional and physically challenging walk. We have spent many hours on the track opening up new areas for trekkers to visit pertaining to the Kokoda campaign. Come and climb our challenging little mountain, Mt Wilhelm, PNG and Oceania’s highest mountain at 4509 meters. This is one of the most stunningly scenic areas of Papua New Guinea. For a smorgasbord of culture come visit us in August. Combine climbing the mountain followed by attending the famous Mount Hagen cultural show. Not to missed. PNG Trekking Adventures (PNGTA) is an inbound licensed tourism company. PNGTA approaches adventures in PNG on a personal level, focusing on the individual experience for our guests. Treks and Cultural Tours are limited to ten – 15 people so you enjoy a more exclusive journey where you are an individual and not just part of a large group. PNG is generally warm to hot and humid throughout the year. There is a rainy season, which varies from province to province, however, in general, it's driest from May to December. The air is clean; watch out for sunburn, particularly in the Highlands, even on overcast days. Up in the Highlands it is a lot cooler and wetter. PNG Trekking send all clients a medical certificate that must be filled and signed by their Dr before a trek commences. Check with your local doctor to see which vaccinations are recommended. You should ensure your tetanus booster is current. Malaria poses the most serious health risk. Advise your Doctor you are going to PNG for 11 days or so and will be spending 6-9 of those on the Kokoda Track. Your Doctor will brief you on the requirements for malarial precautions, which include. Avoiding mosquito bites by using ‘Rid’ repellent and by wearing suitable clothing. Taking anti-malarial drugs as prescribed sleeping under a mosquito net. Everyone will have done their best to be as fit as they possibly can for their Kokoda adventure. There may be health issues with members of the group that don’t appear until they are on the track. Your Guide and our Head PNG guide will do their best to manage the circumstances. It is not unusual for treks to split into two groups. Not all of us are super men or women for 8 days straight. We will have our “off” days no matter how fit we are. The reality is the group can only travel as fast as the slowest trekker. Remember it was mate ship that got a lot of the diggers through the Kokoda Campaign. Always be patient, kind and helpful if someone is feeling demoralized or just having a rotten day. Work as a team it makes the experience a lot easier and friendships will be formed that will last a life time. The track is challenging, a lot of people that come to walk Kokoda have never trekked before let alone in such extreme conditions. They are completely out of their comfort zone. For them to have the courage to come to Papua New Guinea and walk Kokoda is to be admired. Be tolerant of your other trekkers. At the end of the trek you have all shared something totally unique. Every trek is different and the stories you have to tell are special to your trek. Remember it is an adventure and you are here to enjoy. Please respect local customs and traditions. Wear appropriate clothing when bathing in and around villages and camp sites. Always ask before taking a picture Do not use offensive language. Do not offer alcohol or drugs to our PNG employees or villagers. Respect local religious observances. Do not remove any war relics off tracks. Please do not offer sweets or environmentally destructive products to our PNG children. Contact PNGTA office if you would like to donate/give items to the children or villages. All rubbish that cannot be burned is carried out on all our treks. All clients are asked to use designated latrine facilities. All clients must use bio degradable, environmentally friendly soaps. PNGTA has to date supplied a number of villages along our tracks with gas bottles so that they are not cutting down trees to make fire for cooking. We do not cut branches off trees to make walking sticks for our trekkers. Please bring your own poles or hire off PNGTA. Do not pick or destroy our flora and fauna. Remember you are walking through customary land, this land belongs to someone. Please be respectful. Do not drop litter. We ask that our clients treat our PNG employees at all times with respect and dignity. We provide our staff with on going training to ensure that their skills and confidence with our guests are on par with PNGTA standards. Our guides and porters are only allowed to carry a maximum of 18kgs. (This includes their personal items weighing approximately 5kgs) Any excess weight must be carried by the trekker or another porter can be hired. All our employees are supplied with appropriate clothing (boots are optional), food, shelter, health care and above award wages, we set a very high bench mark for the industry in Papua New Guinea. PNGTA has a zero tolerance of alcohol and drugs for our tour leaders, guides and porters whilst working. We do not allow trekkers to share a Personal Porter. We encourage our clients to integrate with the PNG people and our boys. If you give 100% you will get 120% in return. Remember you are here to have fun and an adventure. You are about to embark on a trek of a lifetime. It will be physically challenging and an emotional roller coaster. You will cry and laugh, be sad and happy. This is a journey that we want to share with you. You will grow as a person and may even make some life changing decisions. Like any expedition in life be prepared and do everything you possibly can to enhance your experience. Planning your Trek has never been easier with PNG Trekking Adventures, we have a handy guide that covers everything you will need to know. 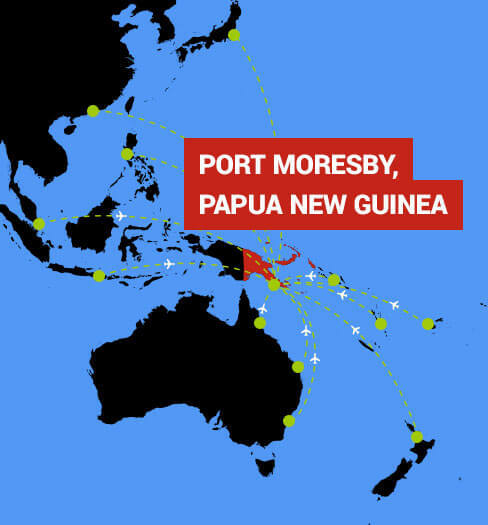 We have infomation starting from Arriving in PNG to Track Safety. Trekkers will disembark their international flight at Jacksons Airport. It is a very small terminal with an ATM and money changer where you collect your baggage just through immigration and an ATM and BSP Bank where you can change money in the arrival complex. PNG Trekking sends all clients a medical certificate that must be filled and signed by their Dr before a trek commences. When embarking on your trek we urge all our clients to employ a Personal Porter. Unless you are an experienced trekker and familiar with carrying weights of 20kgs or more. Everyone will have done their best to be as fit as they possibly can for their Kokoda adventure. There may be health issues with members of the group that don’t appear until they are on the track. Use our equipment list to check off everything that you need. Maybe get someone to check it for you as well. For Kokoda trekkers only we will check your gear when you get to Port Moresby. You will need casual clothes and footwear for in Moresby. Make sure you bring another lockable bag, can be a soft bag so you can leave your "City/Travel Clothes" and valuables in it if this is required for any of our expeditions. Make sure when you are booking in at the airport that your back pack is strapped up or is in a tote bag. Airlines tend to be tough on anything that is hanging lose. You do not want the straps of your back pack torn off.